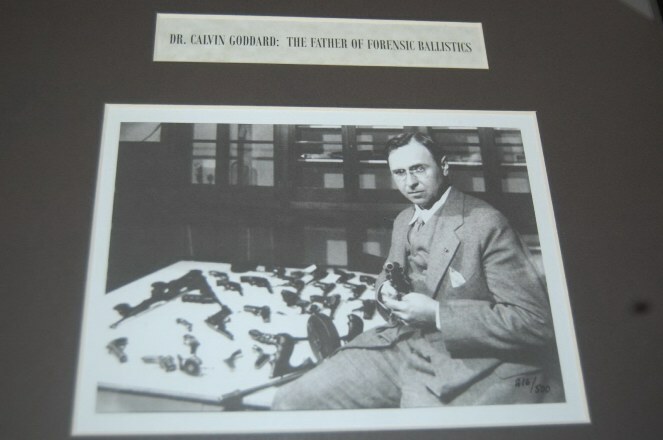 I want to express my deep felt thanks to a few individuals who help my goal of actually seeing and holding the murder weapons used in the world reknown unsolved crime called the St. Valentine's day massacre. I have been following this crime since 1987 at the same time as the subject of Al Capone. First off to Mr. Randall Ellsworth who helped me get the private viewing. Thank-you Randall! 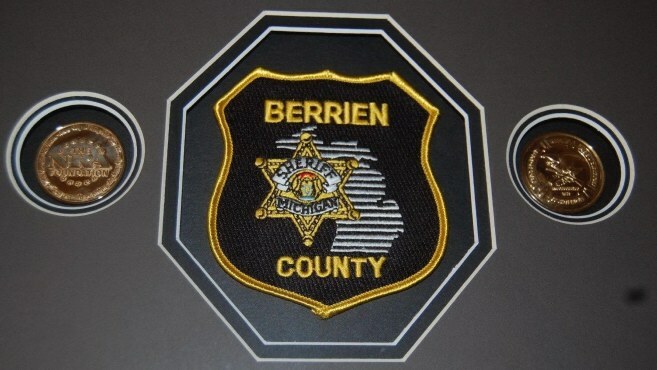 I want to thank the Sheriff of Berrien county Sheriff Paul Bailey who gave the okay. Bill Marks for being kind in contacting me and giving directions. Lt. Michael W. Kline who treated me a like royalty. I really never met such a nice gentleman as Lt. Kline who took the time to explain the history of the guns and patiently let me take all the photos I wanted. 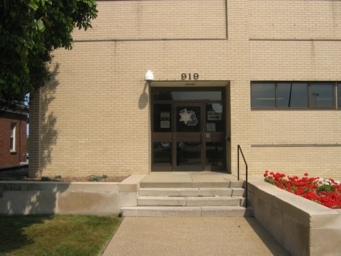 Entrance to Berrien County Sheriff's dept. 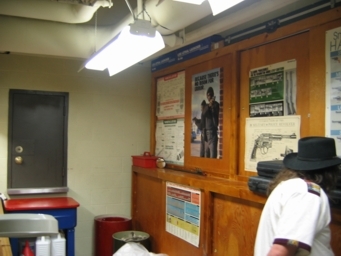 The armoury where the Massacre guns are kept. 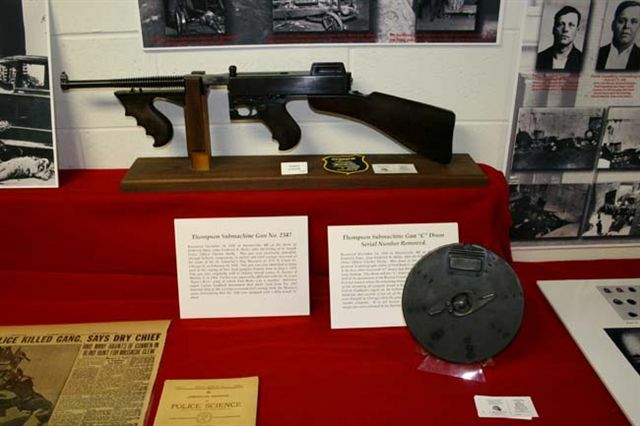 The two thompsons used in the massacre in great condition. 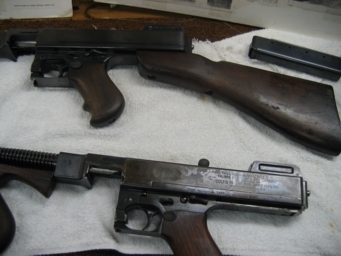 One thompson still has acid marks from Calvin Goddard's resurfacing of the serial numbers in 1929.The other gun was re-blued when a water leak in the armoury caused it to rust. 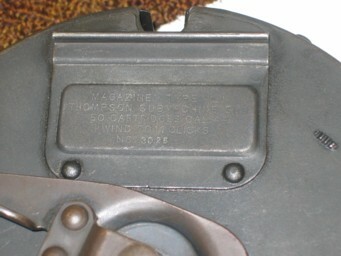 Closer view of acid marks for raising serial numbers very visible today. 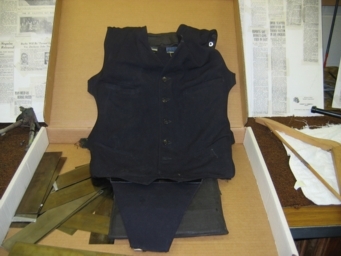 Fred "Killer" Burke's bullet proof vest found with the massacre guns hidden in his Stevensville home.Note the vest is deteriorated and the steel plates are coming undone. 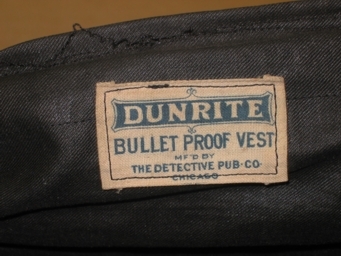 Tag on bullet proof vest made in Chicago. The very kind Lt. Michael Kline watches on as I give my best tommy toting pose with the Thompson serial number 7580 used in the massacre. 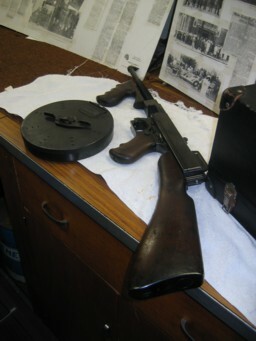 Heavy gun with the 100 round drum. 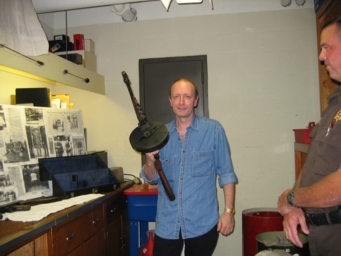 Holding the 50 round chopper serial number 2347 used in the massacre of 1929. 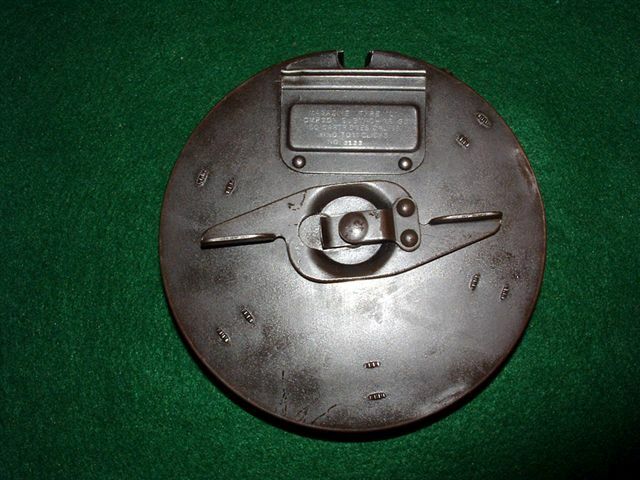 Used in the massacre were only one 50 rd drum and one 20 rd stick magazine.The hundred round drum along with many other clips were found in Burke's posession besides the massacre guns. 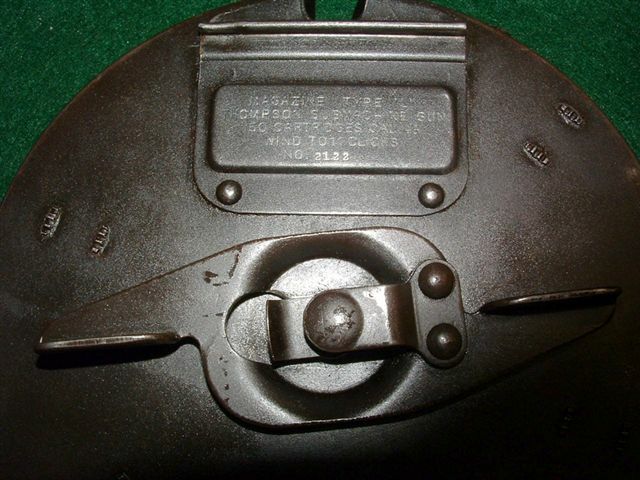 The "C" drum's serial numbers are ground off. 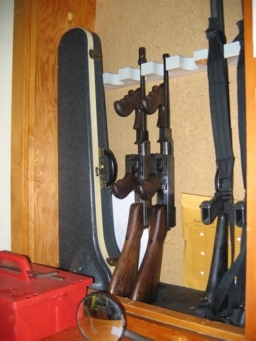 Fred "Killer" Burke's tools of the trade. 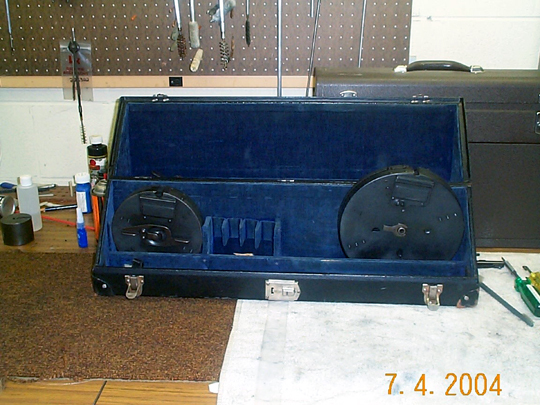 Another view in the case.Actual retrieval from Burke's home did not include this case.The cases found at Burke's home were more similar to suitcase luggage. 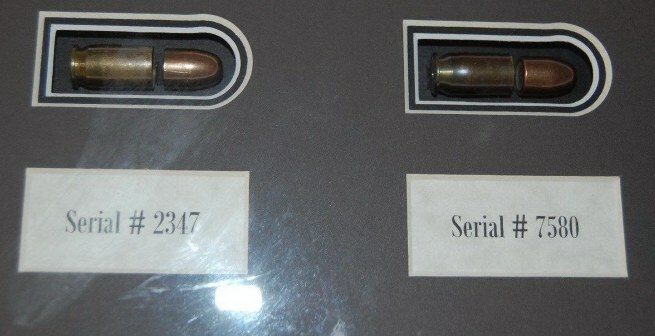 .45 caliber bullet from Fred Burke's arms cache. 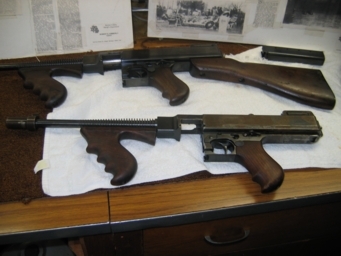 Well preserved by the Berrien county gunsmith.These guns were fired in a recent documentary. 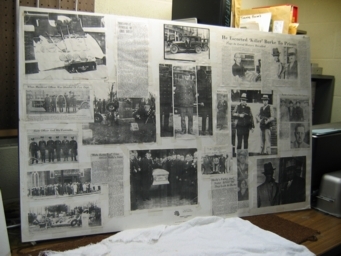 Newspaper clippings tell the story of Burke's arrest after shooting an innocent policeman.This was probably done on purpose by Burke to avoid prosecution in Chicago for the seven massacre deaths. A jovial Burke happy to be arrested.He first thought the arresting police where hitmen sent to shut him up. 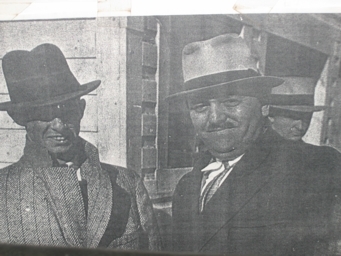 Click on the photo for more info on Fred"Killer' Burke and his capture. 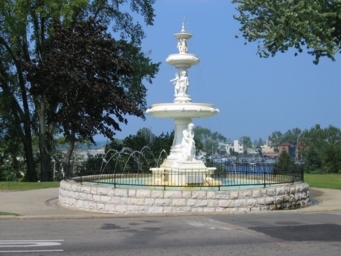 The following photos are supplied by the kind permission of Mr. Chuck Schauer. 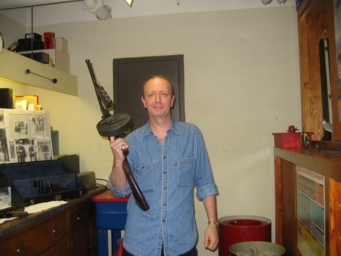 Mr. Schauer is an avid Massacre sleuth and Thompson machine gun expert. 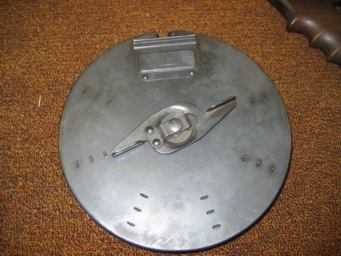 Thompson drum once in ballistics expert Calvin Goddard possession. 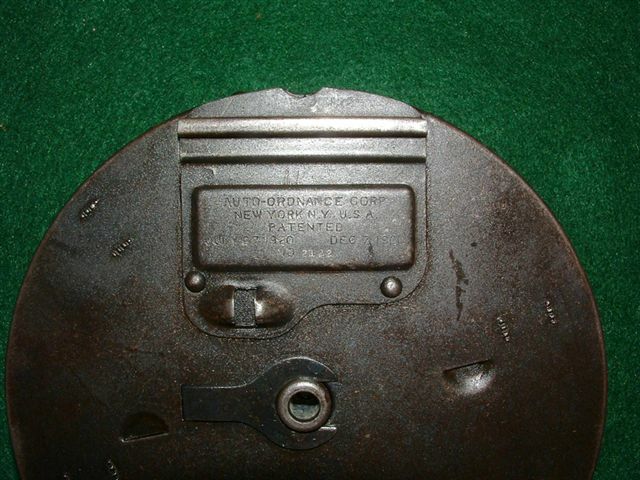 Ironically enough the serial number of this drum is 2122.Same as the address where Moran's men were killed. 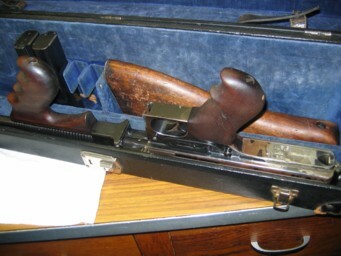 Massacre gun serial number 2347.These two weapons made a surprise visit to a Thompson association show in which this thompson was fired by a few lucky shooters. 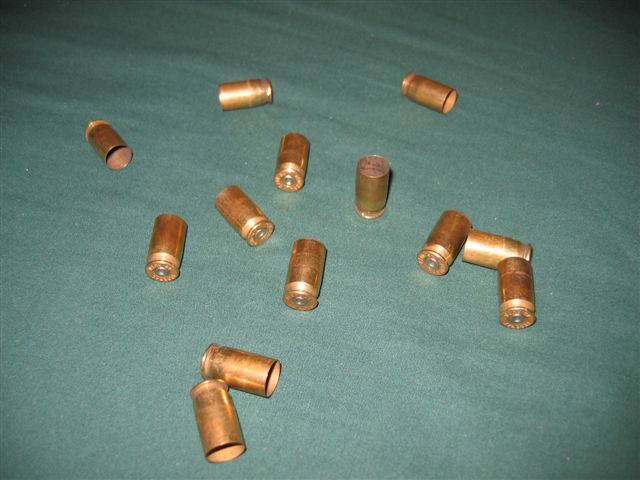 Spent shells recently fired from Massacre Thompson 2347. 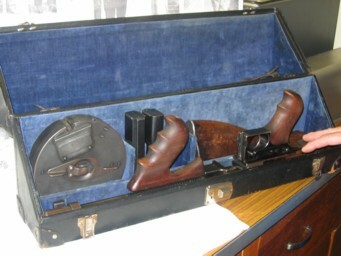 Two of the drums pick up from Fred "Killer" Burkes home by police.These guns were proven by ballistics to have been used in the massacre of Feb.14,1929. 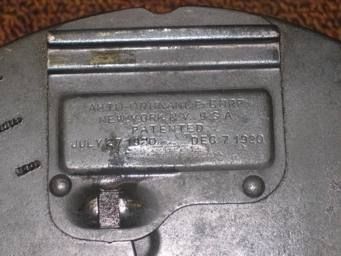 Massacre gun from February 14,1929.The discolouration is from acid used to raise the serial numbers which were ground off by the killers or a gunsmith. 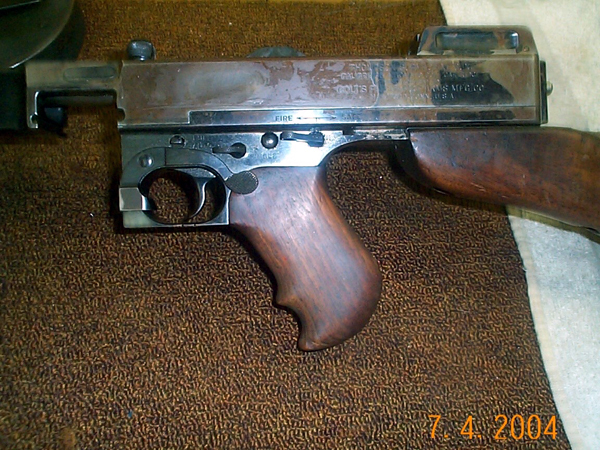 This Tommy gun is serial number 7580. 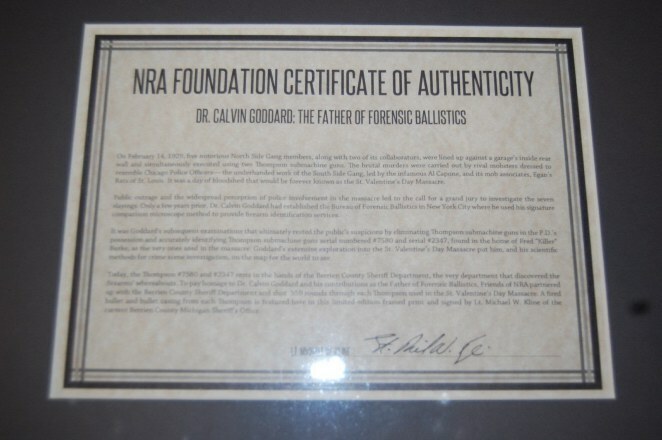 It was sold to one James"Bozo" Shupe a criminal who was killed on Chicago's west side.Ballistics expert Calvin Goddard used acid to awe the Coroner's jury when in fact the serial number could have simply been found inside the gun or by contacting Colt arms to examine it. 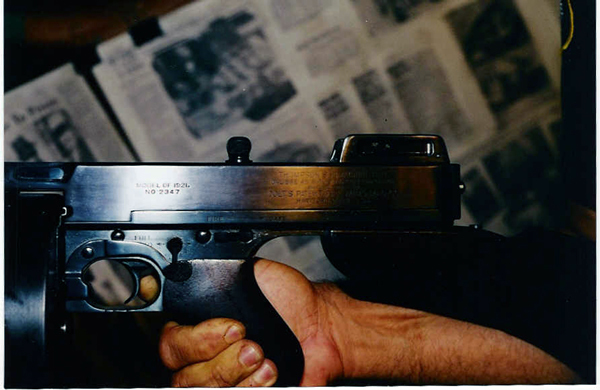 Photo of one of the St. Valentine's day massacre guns at the Berrien County Sheriff's office. 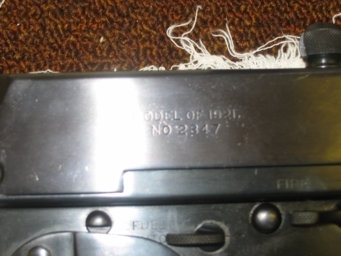 No 2347 was purchased by Deputy Sheriff Les Farmer of Marion, Illinois on November 12,1924.Farmer had hooked up with the Egan's Rats gang before they had collapsed as a gang and the gun evetually ended up in Fred Burke's posession. (Photo courtesy of Mr. Randall Ellsworth). NRA/ Berrien County Sherriff's Dept limited St. Valentine's Day Massacre frame. A special thank-you to Mike from Tennessee for making this special frame now a part of my collection. 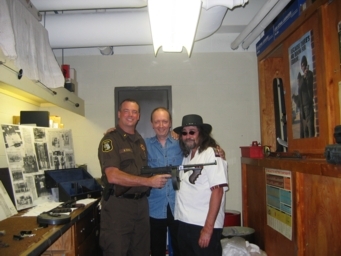 In 2012, Friends of the NRA, in conjunction with the Berrien County Sheriff's Dept offered this limited time framed displaycontaining a slug and shell that were fired from each of the two infamous Thompsons. Only 550 were produced for auction. 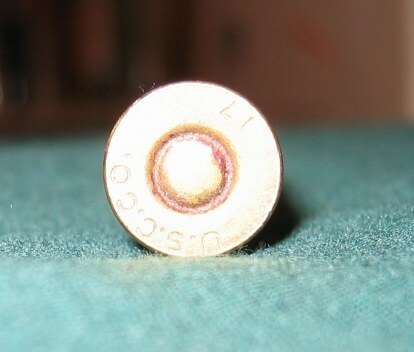 Close up of fired rounds. 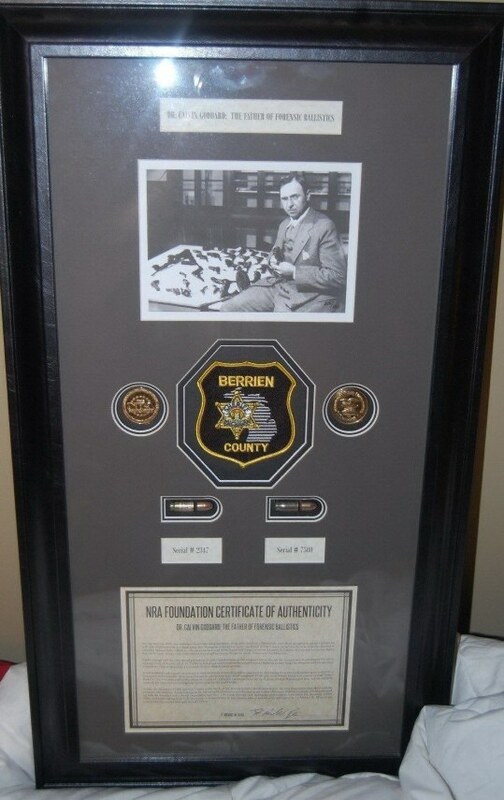 NRA coins and Berrien County Sheriff's dept. patch. Certificate of Authenticty signed by the infamous Thompson's caretaker Lt. Mike Kline. 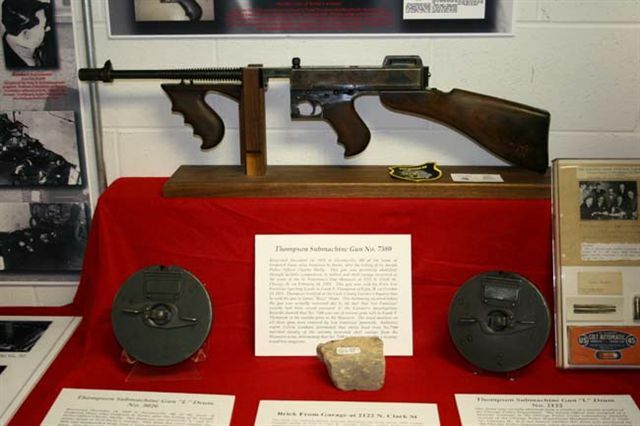 Although the firing time in that scene is greatly exaggerated, here is an honest version of how long it takes to empty a 50 round Thompson drum.